Tony Perkins, President of the Family Research Council, addresses a luncheon at the National Press Club September 12, 2012. 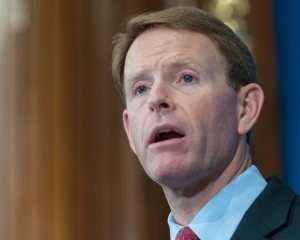 Value issues will be salient at the polls in the November election, Family Research Council President Tony Perkins told a National Press Club audience Sept. 12. “The sanctity of life, the sacredness of marriage, the boundaries of sexual expression and the exercise of religious freedom” are issues that matter and “rank as fundamental,” Perkins said. He said he would advocate these values with civility and compassion. “We are more committed to advancing faith, family and freedom than ever before,” Perkins said. Republican presidential candidate Mitt Romney is doing a good job, he said, talking about faith, family and religion. “There’s no question we have differences of opinion but we have a shared value system,” Perkins said. FRC was in the national spotlight last month when an armed man entered their office building in downtown Washington and shot building operations manager Leo Johnson as he was inspecting the assailant’s backpack. Perkins thanked people worldwide, including Washington Police Chief Cathy Lanier for assistance. He repeated a call to the Southern Poverty Law Center and the Human Rights Campaign to rescind their classification of FRC as a hate group. Their “language is meant to inflame and not to inspire, to intimidate and not to illuminate, to poison and not to persuade,” Perkins said. Yet he acknowledged profound differences among Americans. “Our nation is both closely and sharply divided,” he said. FRC’s seventh Values Voter Summit begins Friday in Washington, where attendees will be reminded that values issues are critical and asked to pledge to three actions before the election: pray, prepare and participate.